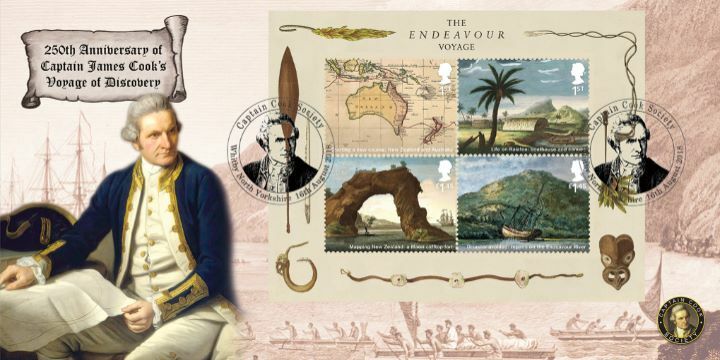 Notes: Royal Mail marks the 250th anniversary of Captain Cook setting sail in one of the greatest voyages of discovery of all time aboard HMS Endeavour with nearly 100 men including astronomers, artists and scientists. The expedition was an incredible success, during which Cook and his men initiated the first European contact with Eastern Australia, mapped New Zealand and observed the transit of Venus. The three year voyage revealed unprecedented information about the lands, peoples, flora and fauna of the Pacific to European eyes, and set new standards for cartography, scientific enquiry and exploration. These covers are printed on the finest quality linen textured paper and then lovingly hand made into envelopes. The above Royal Mail Captain James Cook stamps were issued on 16 August 2018 by Royal Mail and feature the following stamp designs: 1st Chart of Discoveries; 1st Boathouse and canoe on Raiatea; £1.45 Maori clifftop fort; £1.45 Reparing the Endeavour. The Captain James Cook first day cover with the Whitby, James Cook Society, Special Handstamp postmark has been produced by Bradbury and features these stamps which can make a very collectible and lovely gift.